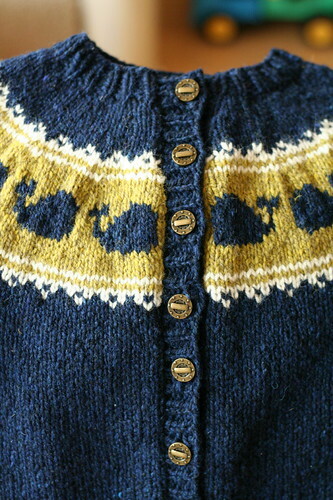 Growing up on Cape Cod in the 1980s, I have many memories of nautical themed sweaters, with boats, anchors, captain’s wheels, or whales forming the yoke. With these sweaters came Nantucket jewelry baskets, alligator polos (collars flipped up, of course), plaid pants, embroidered pants, and any other garment with the shape of the Cape Cod arm littered gratuitously about. This cardigan was inspired by a pullover my mother started for me and finished several years later for my brother, if I am not mistaken. I thought it might be a fun design to revive. Since winter is almost over and I will soon be packing away her size 2 winter clothes, I knit Beatrix the size 3-4 yr for next year. The garment is knit from the bottom up in the round and then steeked open. Those unfamiliar with crochet steeks are encouraged to read Eunny Jang’s definitive steeking tutorial before proceeding. Only feltable wools with plenty of grip should be used for steeking purposes. Neither superwash wools nor plant or synthetic fibers will hold. Although it would be easy to modify the pattern to work back and forth without steeking, the instructions are written for construction in the round. Note: Swatching the stranded pattern in the round is imperative. I chose to cast on 36 stitches for three whale pattern repeats plus 7 stockinette stitches for a steek. In addition to checking gauge, this extra swatching will provide a valuable opportunity to practice steeking. Harrisville Designs New England Highland (100% wool; 200 yd [183 m]; 100 g [3.53 oz]): 1(2, 2, 2, 3, 3) skeins #33 Midnight Blue, 1 (1, 1, 1, 1, 1) skein #44 white, 1 (1, 1, 1, 1, 1) skein #7 Tundra. The steeked facings are tacked down with a simple blanket stitch. You’re packing away winter clothes? Sigh. This time of year I (sort of) miss Kansas. The sweater is very cute. I also spent a lot of my preppy high school years at my aunt’s house in Harwichport with my collar popped and my topsiders on. I remember going in to Chatam to shop at Puritan’s and Mark, fore and strike, the holy grail of the preppy world. Today I would not be caught dead in a pair of kelly green pants with blue whales on them, but I still have plaid shorts. I absolutely love this sweater. I think the blue whales on the olive background are brilliant! I really like the whales without the spouts. I would love to have an adult-sized version of this for myself :). 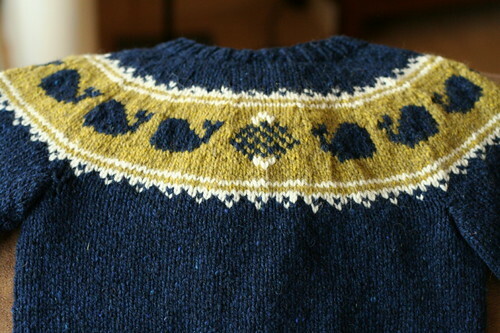 It’s like that buffalo sweater I knit a while back, but much more classy. Also, B with bows in her hair is adorable. I nearly busted a gut after reading your note about matching family sweaters! Thank you! I’m half way to the button holes on my seed stitch jacket and can’t wait to see it on my youngest. Absolutely amazing! I love it! I’m gonna have to make this for my daughter! I guess I should plan ahead and do a size or two larger! Steeks scare me. BTW, I have several balls of Rowan wool cotton heading your way this weekend. I love the sweater. It’s really adorable! Maybe it will be my foray into steeking…. That’s adorable! If I were to make it I’d use blue and green, in memory of the dearly departed Hartford Whalers (sniffle). Sigh. New England style. Gotta love it. (and I still own topsiders — navy and plaid ones, to be exact. And I LOVE them). 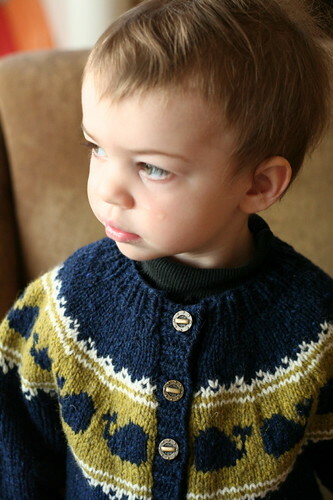 I love the sweater…there must be nostalgia in the air, as I have been swatching and scheming similar themed items. Sidenote – this: http://www.youtube.com/watch?v=4y4-5Zouvjs is hilarious, if you have not yet seen it. That is too cute! I especially love the colors you chose and the buttons! 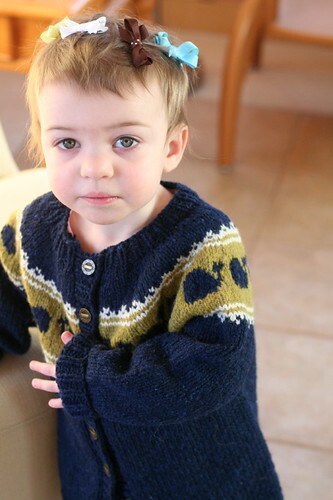 Absolutely beautiful, both sweater and child! I am such an admirer of your work. It’s just lovely. I love this, Elinor. It has just the right amount of cuteness. Do you happen to be talking to me when you say not to make a whole family of these for the Christmas card? ‘Cause you know how I feel about knitting multiples. How cute! The colors are great and I love the buttons as well! Wow, that is absolutely beautiful! And so is she! I absolutely adore this. 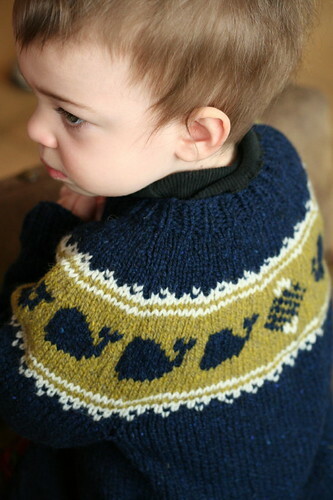 I am totally going to knit one of these for my Hypothetical Future Child. This is what I like about knitting. I am not a particular fan of navy, light green or white, but put them all together in your particular ratio, and the whole thing is irresistible! The cardigan looks great & I love the color combination. 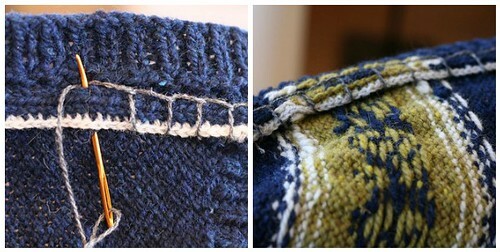 I like the way you present all the details of the project – this really helps a knitter decide if it’s a feasible project. i love the whales. so precious! the last picture of your daughter (the one with the bows) is beautiful!